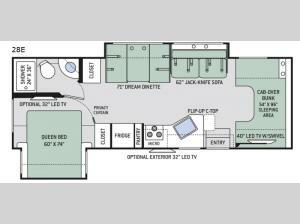 Two slides, a rear bathroom, and a 54" x 96" bunk over the cab are all features that you will find throughout this Four Winds Class C gas motorhome. In this kitchen you can easily whip up a hearty breakfast for your family on the three-burner range before you head out for a day of fun and adventure. The flip-up countertop is an ideal spot for a toaster or coffee maker, and the large kitchen sink is perfect for washing those dirty plates quickly afterwards. You can even choose to relax indoors on the 62" jackknife sofa or 71" Dream Dinette if the weather outside is too dreary.